Like the rest of Bachmann's line of iffy trainset locomotives, their venerable 4-8-4 has a long and tortured history of assorted revisions and modifications. There have been four basic mechanisms employed in this model (that I know of), although the locomotive and tender shells have remained basically the same throughout (more on that later). All pickup is derived from the 8 drivers (transferred to the chassis via really clunky looking wheel wipers). The headlight is housed inside of a weight inside the smokebox. The motor is a square, open-sided 3-poler. All of the running gear is blue (huh?) plastic. The "long distance" tender has a Rapido coupler on the back and the locomotive has a small dummy knuckle coupler on the pilot. The tender hooks to a plastic drawbar on the locomotive. No traction tires. Performance on this first version isn't great, although I've certainly seen worse. Throttle response is actually quite fine, as is slow speed creepability. On the downside, it's loud enough to wake the dead. Worse still, the limited pick-up scheme makes navigating through turnouts without stalling a virtual impossibility. On the plus side, it doesn't seem to have any problems holding the rails on sharp (9.75"-radius) curves. Pulling power seems adequate. To remove the locomotive shell, unscrew the screw in the boiler dome (in the middle of the shell) as well as the screw underneath the pilot truck. The shell should just slide up and off at that point. The headlight is now mounted to the chassis (rather than living inside the shell). The pickup scheme is completely redesigned. Left-rail pickup comes from the left four drivers (and no more wheel wipers), while right-rail pickup comes from the tender (from the inner two wheels on each truck). The drawbar has moved to the tender, which hooks onto a peg on the locomotive. Current is transferred from the tender to the locomotive via a stiff wire on the drawbar. The third set of drivers (counting from the front) no longer has flanges (who knows why), while two of the drivers on the right side (front-most and rear-most) now have traction tires. The motor appears to be the same one as on the first version. The running gear is still plastic, albeit now black. The locomotive shell is held to the chassis by a single screw in the smokestack, along with a couple of clips at the back of the cab. 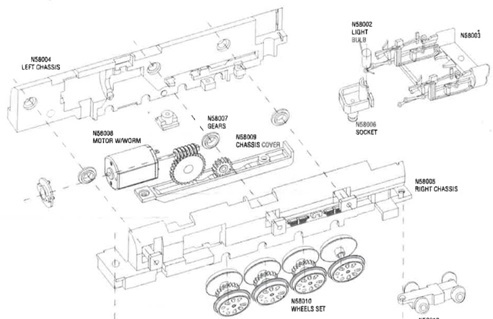 The forward truck has a spring added for downward pressure. AFAIK, these came in the same black/yellow packaging as the first version (or at least mine did). Maybe it's just the one I have, but performance on this version is actually quite a bit worse than on the first version. Moving all the right-rail pickup to the tender seems to me to have been a zero-sum gain. Worse still, the addition of thick traction tires has definitely introduced all kinds of wobbliness into the equation. And the springloaded front truck? Hell, it won't stay on the rails at all! Oh yeah, and it still runs loud enough to wake the dead. And my most hated feature of this version? Trying to keep the damned drawbar between the locomotive and tender coupled while getting all those wheels situated on the rails! All told, this version is definitely the worst of the bunch. The motor is a closed "can" job (no idea how many poles, but judging by the meteoric top-end speed, I'm assuming three). The running gear is now metal (although the hangers are still black plastic). The pilot truck spring is gone, as are the non-flanged drivers and the tender pickup. Pickup is now derived from the front six drivers (the rear two having thin traction tires) along with both the pilot and trailing trucks (the pilot picking up one rail and the trailer picking up the other). All wires have been removed from the equation (yay). The drawbar is still connected to the tender, but the locomotive now has a nice oblong hook that helps keep the danged thing reliably coupled. Once again, the locomotive shell is held to the chassis via a single screw inside the smokestack. Performance on this version is actually quite respectable. It's still a bit loud and toyish sounding, but nowhere near as loud as the earlier versions. Throttle response and slow speed performance are both decent. The motion of the running gear is pretty smooth, pulling power is good, and getting through turnouts and around narrow radius curves doesn't seem to be a problem. Overall, a solid (if unspectacular) "trainset style" steamer. The chassis is a slick looking split-frame job. The motor is an open-sided 3-poler with skew-winding. The pickup scheme is basically the same as the previous version, although the traction tires have been relocated to the #3 drivers. The running gear is also the same, although the wheels are now blackened. The screw holding the locomotive shell to the chassis has once again moved, this time from the smokestack back the middle of the shell. These come packaged in a clear plastic jewell case and are still being manufactured to this day. 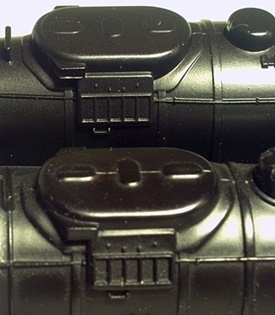 More recent production runs come with Bachmann's proprietary one-piece knuckle coupler on the tender (as opposed to the old Rapidos). I've purchased a couple of these split-frame 4-8-4's, and performance has varied quite a bit (QC always seeming to be a problem with Bachmann). On the first one, all of the wheels (locomotive and tender) were out of gauge, and the wheel-blackening "stuff" was slathered on so heavily that, out of the box, the thing barely ran. And even after cleaning and re-gauging the wheels, it still ran just a bit herky-jerky and uneven. As for the second one (purchased in 2010), well... wow! I took it out of the box, put it on the track, gave it a bit of throttle, and then watched in sheer dumbstruck awe is it proceeded to glide around the rails absolutely flawlessly! I mean super smooth, super quiet, and with nary a shimmy, wobble, stutter or hiccup to be found. Toss in superior pulling power, and what we have here is a steamer that runs every bit as well as the best models from the likes of Kato and Life-Like. OK, that old 1970s-era shell is still a bit of an eyesore (what with all the molded-in detailing), but performance-wise, it really is quite a wonder. Here's hoping that they're all this good now, and that Bachmann has finally started to put their QC problems behind them. Note - if you ever wind up with one of these newer 4-8-4's and find it to be a herky-jerky runner (as I did on my first try), I've since read that performance can be improved significantly by adding coiled springs (not too stiff) to the screws that hold the pilot and trailing trucks to the chassis. This modification (courtesy of the inestimable Doug Gosha) purportedly goes a long way towards improving electrical conductivity from said trucks. Circa 2015, these models were revised yet again (with the main change being a new closed-sided can motor). The chassis was also modified slightly to accommodate said new motor. I haven't had a chance to try out one of these newer 4-8-4's yet, but one would assume that they run at least as well as the previous version (IE, very well). Note- Bachmann released Norfolk & Western 4-8-4 "J Class" steamers in 1988 and 2006. Those models have nothing in common with this one (different shells, different mechanisms, etc). Trivia - Richmond Controls makes an electrical contact improvement kit for these models (designed to be installed in the tender). I don't have any experience with them myself, but one would assume that adding tender wheel pickup to these models could only serve to make them run better.